On your Antigua vacation you too can experience the excitement of fishing Marlin, Tuna, King fish, Dolphin (fish), Wahoo, Shark or Barracuda, in the Atlantic waters of Antigua with "Overdraft" and “H2o” deep sea fishing charters. We pull out all the stops to make your visit to Antigua an exciting and memorable experience. Captain Frank Hart knows Antigua's Atlantic fishing grounds better than most, and invites you to share in the excitement of sport fishing in Antigua. 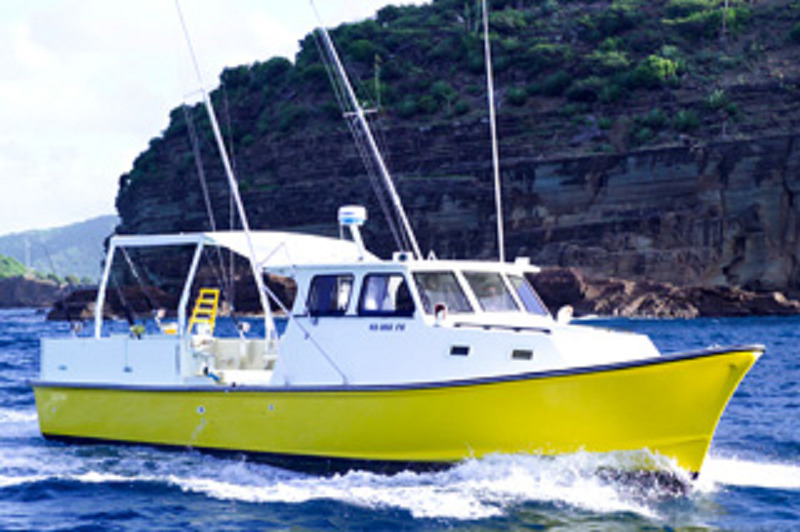 Overdraft is a fully equipped and spacious 40 ft sport fishing boat that can accommodate up to six guests. It's wide deck and ample awning provides you with a stable, shaded area to catch "The Big One". "Overdraft" is licensed for charters and is Coast Guard certified with all safety equipment onboard, lifejackets and first aid kit. Boat is fully insured with public liability @ Anjo Insurance. Boat is equipped with a head and all fishing needs. ( Marlin Fighting chair.) Captain's name: Frank Hart with 20 years fishing experience. Antigua sport fishing charters are available for four, six and eight hour charter and departure times are flexible.